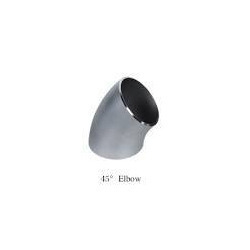 Size (inches) 1/2" TO 24"
We are one of the well-known manufacturers, exporters, suppliers, importers, wholesalers and traders of 45 Degree Elbow. The offered forty five degree elbow is very widely used in the industrial applications such as chemical plants, fertilizer units, distilleries and sugar mills. Our supplied forty five degree elbow is very popular in both the domestic and international market. The wholesaled forty five degree elbow is easy to install and fix. Alloy Steel : ASTM A182 F1 / F5 / F9 / F11 / F22 / F91 etc. Carbon Steel : ASTM A105 / A694 F42/ 46 / 52 /56 / 60 / 65 / 70 / A350 LF3 / A350 LF2, etc. Incorporated in the year of 1994, we, Rajsuri Steel House, are among the prominent manufacturers, suppliers, traders, wholesaler, exporters and importers of quality assure collection of Stainless Steel Dairy & Fittings Products. Under this product array we are offering superior quality Pharma T.C. Fittings, Stainless Steel Dairy Products and Stainless Steel, Carbon Steel & Alloy Steel Forged Fittings. Our offered collection of products is designed as per the set international norms by utilizing supreme quality basic material. Our offered products ranges are highly admired by our clients for their smooth functioning, rugged construction and longer service life. To suit our customer ever-changing demands in an efficient way, we are offering these products in various specifications. Apart from this, one can avail these products from us at budget suited price range. Our products are designed and fabricated at our well-developed infrastructure unit as per the industry defined norms. To operate our business tasks, we have hired a team of professionals. Our professionals have vast industry experience and deep knowledge of this field and offer us the best quality product in the market. We have installed all the latest machines and tools at our facility to manufacture the offered product range. Owing to our highly advanced manufacturing unit, we have been able to cater the bulk need in requested frame of time. We have a well-connected distribution network, which helped us to deliver the offered products within committed time period.